Wellness for the World: I Get Sick Too! Yes, believe it or not, I get sick too. As I am writing this newsletter I am on the tail end of 4 days of pain and suffering. You know what I mean, starts with a scratchy throat and headache, maybe diarrhea or constipation while leading to sinus and lung congestion. This of course has you coughing all night, blowing your nose constantly and disrupting your sleep. Oh and toward the end, every muscle in your body aches. 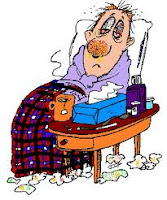 Did you know that in the US, more than 60 million cases of the common cold occur each year, resulting in the loss of 22 million days of work annually. Well, after the holidays is often the time of the year when this jumps on us. No wonder why, since there are often less than optimal food choices with the holidays and generally too much alcohol. All this with the stress of so much to do during the holiday season and too little sleep. It's no wonder we don't all get sick around the holidays. Getting sick on occasion is very real for all of us. To be honest, with the level of toxicity that we live in on a daily basis, getting sick is a natural way for you body to push out the toxic build up. How our body deals with this is based on your level of health moving into the sickness. Healthy individuals go through this process in about 3-5 days, while those with less than optimal functioning immune systems may linger in the symptoms for weeks or it may go away only to creep back up when you thought you were in the clear. Regardless of going into this with a strong or week immune system there are definitely steps to take to assist your body's ability to fight the cold and flu. First, do not take anything that suppresses symptoms. No cough suppressants, anti diarrhea meds or anything to stop your nose from running. When you body is trying to get rid of something toxic, do not suppress it, help it. Simple things like staying hydrated (1 quart of water per day for every 50 lbs of body weight), deep belly breathing often through the day, get enough sleep (nap if you cannot sleep through the night) and definitely stay away from sugar and alcohol. Since most of your immune system originates in the gut, be sure to take probiotics. About 20 billion active bacteria per day is usually good but if diarrhea is an issue, you may want to take closer to 110 billion. for the duration of your cold or flu and I always recommend taking this in a liquid form. Zinc is also powerful mineral to be used during this time. Scientific theory suggests that the cold virus causes infection by attaching to receptors in the upper respiratory system and reproducing. Zinc ions, it's believed, compete for these same receptors and thereby prevent the cold virus from replicating. In a sense, zinc and colds are natural adversaries. Add to this to fact that most in our culture are zinc deficient. One more note is that the mineral zinc also adds and antioxidant property which is also helpful. I of course recommend a liquid form of zinc and during your down time, about 30 mgs per day is suggested of liquid zinc. If your sinuses are an issue, I would recommend the use of a Netti pot with a saline solution in the morning and before bed. You can watch a YouTube video with Dr Oz on Oprah to see what this is all about and they can be found at any drug store and most grocery stores. Also recognize that as your immune system is destroying the pathogens and toxins, there is also a build up of toxic chemical in your body. This is the main reason for the muscle aches and pains. For this I use a simply remedy of taking a hot Epson salt bath twice per day during this time. Please limit the bath to 20 minutes so you are not reabsorbing toxins. Lastly, I have a favorite remedy that few talk about and this is a liquid tincture of peppermint oil. I get these from Germany and all it is peppermint oil and chlorophyll and there are three uses for this. To assist with your lungs and coughing, I pour a cup of hot water and place 2 drops of the peppermint in the hot water. Of course I am going to drink this to assist in clearing my lungs, but prior to drinking this, I will take several deep breaths of the steam of this peppermint tea to assist in clearing my sinuses. Another great use of peppermint oil is to simply open up your bronchial airways by placing one drop of peppermint oil in your mouth, swishing this around you mouth with your saliva and while keeping this peppermint in your mouth, take 5 deep breaths in though your mouth and out your nose. By the second or third breath you will feel that peppermint oil vapors opening the airways in your lungs. The best thing about this remedy is that it is cheap and last for quite some time. I know there are so many remedies from Grandma's chicken soup to high doses of Vitamin C and so much more, but I wanted to share what I do. Remember, I get sick too. If your illness extends beyond 10 days or if you have chronic reoccurring challenges with being sick, seek the attention of your doctor to rule out any serious immune system issues and connect with a qualified natural health practitioner to address these issues at the core. Chronic illness is generally tied into poor gut health and autoimmune conditions that go undiagnosed. If you have any comments or questions in regard to this article, please leave a post below for me to answer directly. Thanks for the great advice. I hadn't thought of flu/colds as a way for the body to rid itself of toxins. A great article! It is my pleasure and thank you for the kind words!